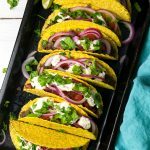 These mushroom ‘meat’ tacos are the real deal. 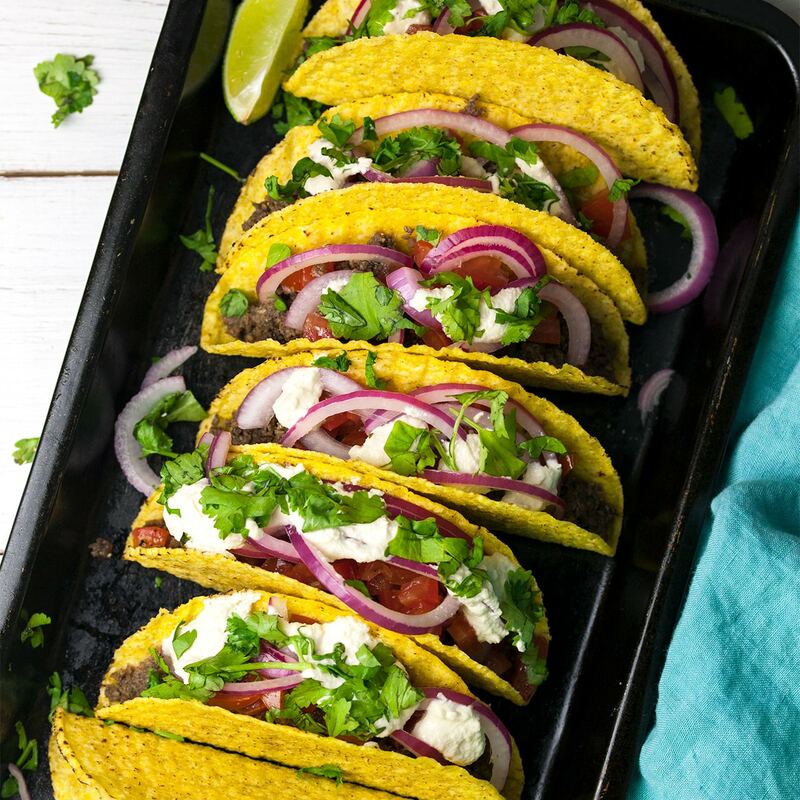 Flavoursome, spicy and and super colourful, Mexican food is one of our go-to cuisines for show-stopping recipes that are just so simple to create and packed with delicious flavours. This is also the type of recipe we roll out when we have friends come over who are new to vegan food. They love the depth of flavour in the mushroom ‘meat’ and it’s always fun passing different toppings around the dinner table. 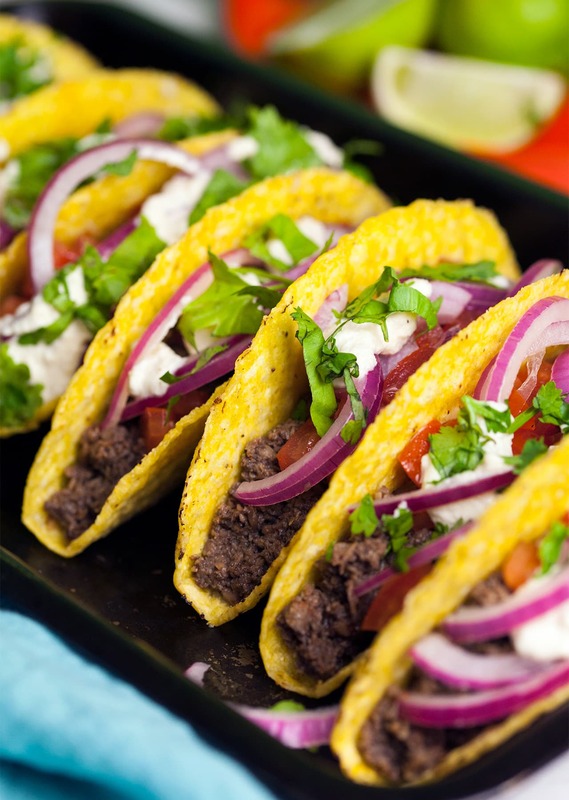 You can use small tortillas if you can’t find corn taco shells. Just make sure you warm the tortillas in the oven before serving! Prepare the pickled red onion by slicing the red onion thinly and transferring it to a small bowl along with 1 tbsp apple cider vinegar. Mix the red onion and vinegar together, then set the bowl to one side while you make the remainder of the filling. To make the sour cream, soak the cashews in hot water straight from a kettle and set to one side. Wash the mushrooms under cold water then add them to a food processor and pulse until all the large pieces have broken down and you’re left with a mince-like texture. Then add the mushroom to a baking tray along with the tamari and olive oil. Stir to combine then transfer the tray to a preheated oven and bake for 15 minutes. Remove the baking tray from the oven and add the cumin, oregano, paprika, chilli powder, garlic powder and salt to the baking tray and stir until all the seasoning is evenly distributed. Then place the baking tray back in the oven for a further 15 minutes at the same temperate, 180°C / 350°F. Meanwhile drain the cashews and add them to a food processor along with the apple cider vinegar, lemon juice and water. Blend until smooth then transfer to a small serving bowl. You may need to add more water if the mixture is too thick to blend into a smooth cream. Rinse and pat dry the tomatoes, then dice into small pieces, discard the seeds as you go, and add to a mixing bowl along with a pinch of salt, pepper and a drizzle of extra virgin olive oil. Stir to combine. 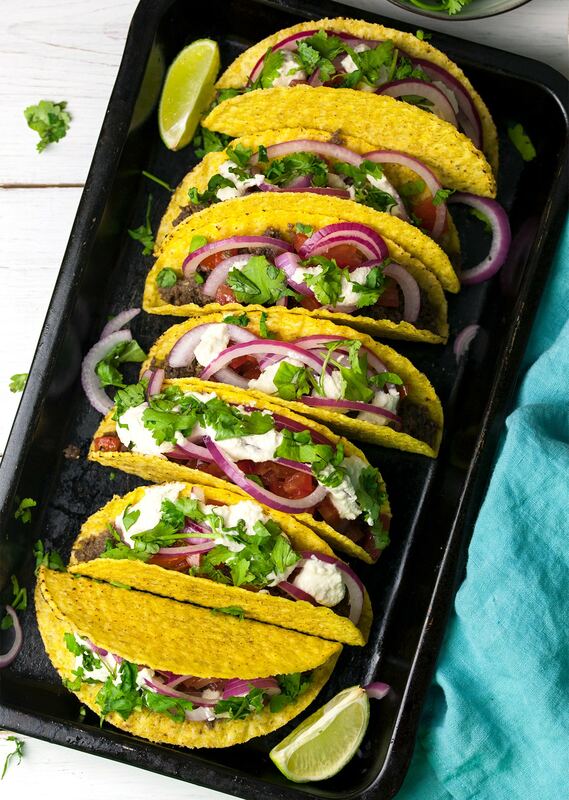 To serve the tacos, add add a couple of tablespoons of the mushroom ‘meat’ into each taco shell, then top with a spoonful of the diced tomatoes, a handful of pickled red onion, a few dollops of cashew sour cream and finally a sprinkling of coriander. Finally, cut the lime into chunks and drizzle lime juice over the tacos. What’s an swap for Chestnut Mushrooms? I’ve never seen these.